He's a little crazy, a little nutty and a whole lot of fun. A.J. Jacobs, editor at large of Esquire magazine and author of several self-improvement books, also happens to be an at large acquaintance of mine. We "met" after I'd posted a review of The Know It All on Amazon, writing about how this book pulled me out of a period of grief after the death of one of my best friends. I guess it touched something within him, as a writer, knowing his work had had such a healing effect on me. It was the nature of his book, the ease of putting it down after reading each short entry and picking it up again whenever I felt like it, that kept me going. And the humor didn't hurt, either. We still "chat" via email now and then. He helps me out by giving me the occasional writerly advice and is generally a kind soul and wonderful person to know. 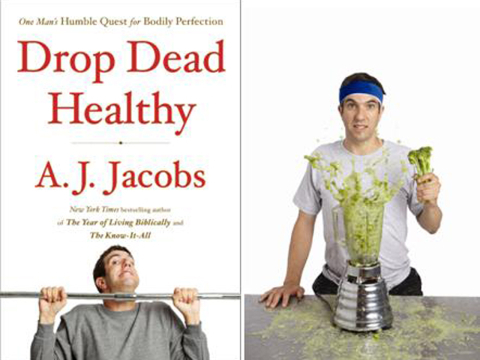 He granted me an interview previously, after the publication of My Year of Living Biblically, and now, once again, upon publication of Drop Dead Healthy. I am a very lucky person, indeed, to know him. 1). What drew you to write a series of human experiment/self education/self help books? Did you intend this to become your niche, after The Know-It-All? I wish I could say it was a master plan. I love to test things out, and I love to write. So this kind of journalism seemed a good match. (I just re-read this answer. I lied. I don’t love to write. I love to research, interview people and think about stuff. The act of writing is about as pleasant to me as a catheterization). 2). What was the reaction from your wife and family when it became obvious you were writing more books a lot of people would consider overly-ambitious? My wife keeps asking me to write something that doesn’t involve major lifestyle disruptions. Maybe a history of wicker furniture. Good point! I hadn’t thought about it, but now that you point it out, I am quite irritated. Slow down, people. Try a word or two a day. 4). Do you have help with your research? Considering my "day job" profession, I have to ask, do you make use of libraries or librarians when working on the background information? This is where you say how great libraries are. Second, I definitely borrowed stacks of books from the NYPL when writing ‘Drop Dead Healthy.’ But I didn’t delegate much of the research. I love to explore the informational detours, which you can only do if you’re researching it yourself. 5). Ever consider writing fiction? If not, why and if yes, where is it? I have considered writing a children’s book. I’m looking for an animal that has never been featured in a story before. My latest idea is to give the blobfish a moment in the sun. 6). Which of your books took longest to write? Which made your family question your sanity the most? The new one, Drop Dead Healthy, took a huge amount of time. It should have been out a year ago. But I had a long journey before I could declare myself healthy. As for sanity-questioning, probably The Year of Living Biblically. Like with the biblical rules about purity. Leviticus says you cannot touch women during certain times for the month. And it even says that you cannot sit in a seat where menstruating woman has sat, because then the seat is impure. My wife found this offensive, so she sat in every seat in our apartment. 7). Have you ever had to scrap a book idea because it was too much work or just too difficult? Not because it was too much work. But I’ve certainly scrapped ideas because they were vetoed by my wife. I wanted to spend a month without face to face communication – live my life totally on line with Facebook and IMs and so on. But my wife said our niece’s bat mitzvah was coming up, and that I was not going to attend by having a monitor at the table with me Skyping from home. 8). Do you have downtime when you can actually read for pleasure? Anything good you've read lately? I just read “The Righteous Mind” by Jonathan Haidt. It’s a great study of how we form political opinions, and why we are so convinced the other side is a bunch of idiots, when in fact we are often idiots ourselves. 9). Any idea what project you'll try tackling next? Will you tell me if I promise not to (verbally) tell anyone else? My kids are lobbying hard for “A Year of Eating Nothing But Candy.” They said they would join me. That aside, I’m not sure what is next. But I do love getting reader suggestions. 10). Is there anything you wouldn't do, or have been warned you'd better not do, even if it would produce a really great book? I don’t like to go undercover. I tell people right up front that I’m writing a book and I’m here to report. Maybe I was influenced by an experiment I once did in which I practiced Radical Honesty for a month. This is a movement that believes you shouldn’t lie. But more important, whatever’s on your brain should come out of your mouth. No filter. Overall, this was a horrible month. But it also taught me the liberating feeling of telling the truth and the stress that lies can cause. Here's a very loooong interview with A.J. I found on YouTube. Unfortunately, I couldn't embed the much shorter interview he did with CBS News, because they wouldn't allow it. Well la-di-da. You don't have to watch all of this one, obviously, since it is almost half an hour long. It's not like I'm going to show up at your house and beat you up if you don't (unless you provide an address in the comments section). However, if you do watch it you're guaranteed to be one of God's chosen people and chocolate will rain from the skies. Your choice, people. Excellent interview! Hilarious, yet thoughtful, answers always make me happy. Looking forward to reading this newest book (and I need to finish A Year of Living Biblically). Not the book’s fault. Life got in the way. Ausgezeichnete Interview! Hilarious, noch nachdenklicher, Antworten machen mich immer glücklich.Danke für das Teilen, sind diese Informationen nützlich, um mehr Artikel me.Hope wird veröffentlicht! Wie gut du bist! Dieser Beitrag ist sehr gut.